After yesterday's overdose of temples, I had the idea of taking an one day excursion all the way to Hiroshima. The train trip would take a bearable two hours, so I only had to get up early enough to ensure I'd have enough time to wander around there. Well, the morning took off pretty slow and I finally managed to leave the guest house slightly before nine o'clock. When I reached the train station and learned that the next hikari shinkansen train leaves for Hiroshima in 50 minutes, I decided to head for Nara instead and go to Hiroshima some other day (there is also a faster and more frequent shinkansen called nozomi, but my Japan rail pass doesn't allow me to use it). Nara was less than a hour away south from Kyoto by a ordinary local train. Nara happened to be Japan's capital from 710 to 785 and has eight Unesco World Heritage sites alone, so it should have something to offer for one day. Once I arrived at Nara station, I stormed the tourist information desk and headed for the Nara-koen park about a 15 minutes walk east, where most of Nara's attractions would be. Typically, there were lots of tourists too, high school student groups and ... over a thousand tame deer roaming free around the park, ready to be tapped on the head in exchange for something to chew (they were considered messengers of the gods back in old times). Going deeper into the park I found myself at the Kasuga Taisha shrine - the largest in Nara - which was founded 1200 years ago. There was an amazing amount of stone lanterns along the path and the place was not as crowded as I feared. A few parents were taking their child to be blessed at the shrine, all dressed up in a traditional Japanese dress (which made other passing students and old women shout "kawaaaiiii!"). Indeed I also admired the beautiful traditional clothes. I just had to get a photograph of one, so I asked one of the mothers in Japanese "shasin o totte mo ii desu ka?" (May I take a photo?). She answered something in Japanese I took as a "yes", since she was smiling and encouraged her shy son to look at the camera and not to hide behind her. I took the photo and it turned out to be perfect. I thanked both of them with a hopefully appropriate "doomo arigatou" thanks with a bow, which the mother replied with a longer sentence I couldn't understand, but it had some politeness words in it, so I guess she was pleased to help. The red painted shrines themselves were also lovely with the green forests surrounding them. After admiring the quiet serenity of the woods and moss topped stone lanterns, I walked north and on the way bought an instant camera as I wanted to get some photos on real film too. On the way further north, I now realized how devilishly clever those vending machines are in emptying my pockets. I mean, they are in every bloody corner and when I have even the slightest thirst or desire to have something to drink, there is a vending machine just within reach, ready to eat your 120 yen in exchange for a soda - which this time around was a Winnie the Pooh lemonade drink. They are a curse and a blessing at the same time. After visiting the Nigatsu-do and Sangatsu-do halls, I arrived at the Toodai-ji temple, which is said to be the largest wooden building in the world. Yes, it truly was huge. And guess what? The current reconstruction from 1709 was scaled down to two-thirds of the original that was burned down in some civil war. This seemed to be typical history for most historic buildings in Japan. Inside the largest wooden building in the world was the largest bronze buddha statue in the world, the daibutsu, originally cast back in 746. I left the temple through the South Gate, which had two huge guardian wooden carvings on both sides. At that point it was easy to understand why the Toodai-ji temple attracts so many tourists. Truly big scale stuff. I wandered around the park a bit longer, bought a box of chocolate marshmallow sweets which were advertised as deer droppings, ate some noodles, then headed back to the station and jumped on a local train back to Kyoto. Overall Nara was worth the trip. The quiet forest surroundings of the Kasuga Taisha shrine was a welcomed experience after a few days of constant background noise. The Toodai-ji temple with its statues of bronze and wood were impressive and the deer wandering around gave the park a special touch, although I can understand those who complain it's too much of a big tourist trap. After arriving at Kyoto station and reading some Japanese music magazines in a magazine store (okay, browsing since I don't understand Japanese), I returned to the guesthouse and went through the routine evening drill by exchanging the days experiences with the other guests, eating some microwave dinner, watching tv and wondering where to go tomorrow before going to bed. 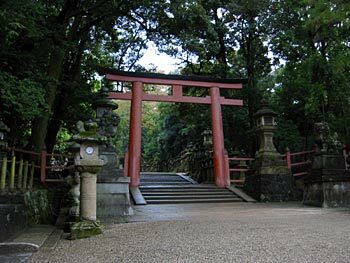 A torii gate that leads to the Kasuga Taisha shrine. One of my favourite photographs from the whole trip. 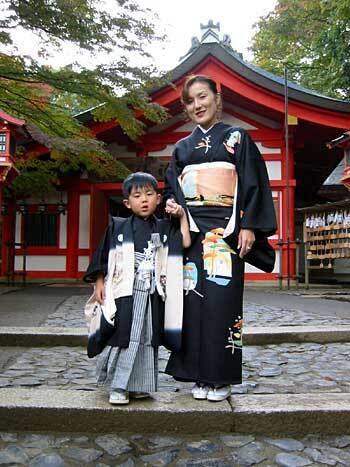 A mother taking her son to be blessed in traditional Japanese clothes at the Kasuga Taisha shrine. The present Toodai-ji temple is only two-thirds of the size of the original thing which was burned down ages ago. 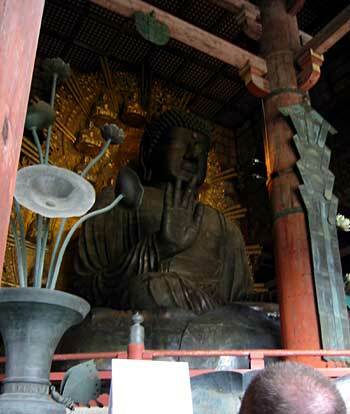 The biggest bronze Buddha statue in the world, the daibutsu inside the Toodai-ji temple. 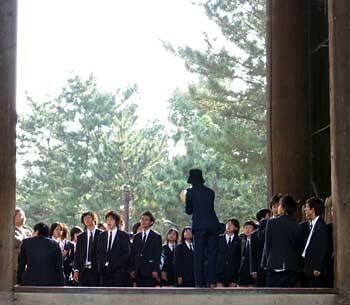 Nara was also invaded by student armies. Why do I always get flash backs from the movie Battle Royale when I see this photo? Nara sightseeing - There is no reason for me to explain in detail what Nara has when Nara's website can do it for me. 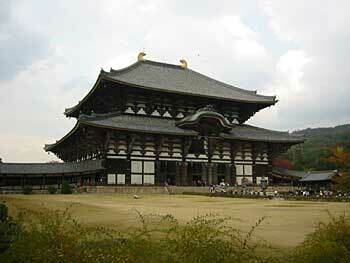 Toodai-ji temple - For those who want detailed information of Nara's star attraction, visit this link.